“A Rose by any other name would smell as sweet”. If we delve into this phrase, from Shakespeare’s Romeo and Juliet, it is saying more important is what something IS not what it is named! A bit of a snub to taxonomy really but we can cope! 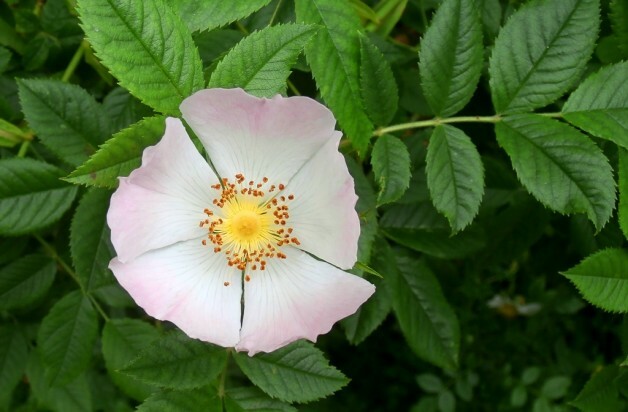 So let’s look into the Rosaceae, which must be one of the most romantic and poetic of plant families? Fruits are achenes (as in buttercups), drupes (as in plums), follicles or pomes (as in apples). 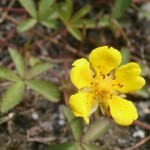 Cinquefoil is the common name given to the whole genus Potentilla because they all have palmate leaves divided into 5-leaflets. 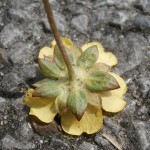 Creeping Cinquefoil is a very common plant of grassland and waste ground creeping by means of stolons (above-ground creeping stems rooting at the nodes) and this plant can form large patches – given sufficient space. There are 5 yellow petals and numerous carpels and stamens so actually it looks rather like a Buttercup at first glance. But the eXtreme botanist NEVER relies on first glances and so check more carefully for the presence of the extra calyx under the true calyx (epicalyx) and look for the leafy stipules at the base of the leaf stalk (petiole), all are diagnostic for Rosaceae and will ensure that you never mistake Potentilla and Ranunculus again! Check out Dr M’s “Strawberries in the lawn” post for more Rosacaeous examples!